Airport in Sochi was relatively modern, no doubt a beneficiary of the recent Winter Olympics. Since it was already nearing sunset and we were exhausted from a long day of travel, we decided to go with the taxi desk in the arrivals area as opposed to negotiating with the taxi mafia to potentially save a couple dollars each. Nice quick ride with a polite driver who coincidentally enough had Abkhazia plates on his car. 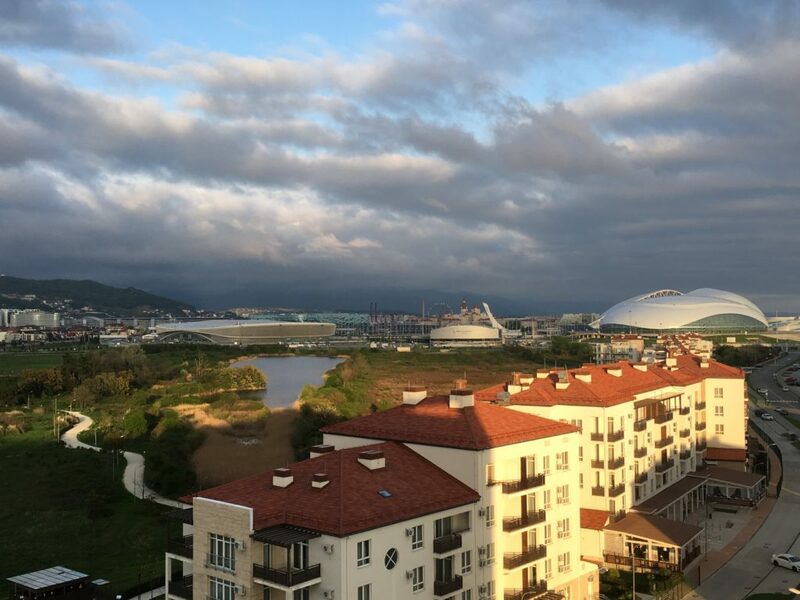 With the sun having set, and the stories of stray dogs around the area (which we never actually saw) there was really no point in trying to see the Olympics sites in the evening, so we decided to head into Sochi for some dinner. 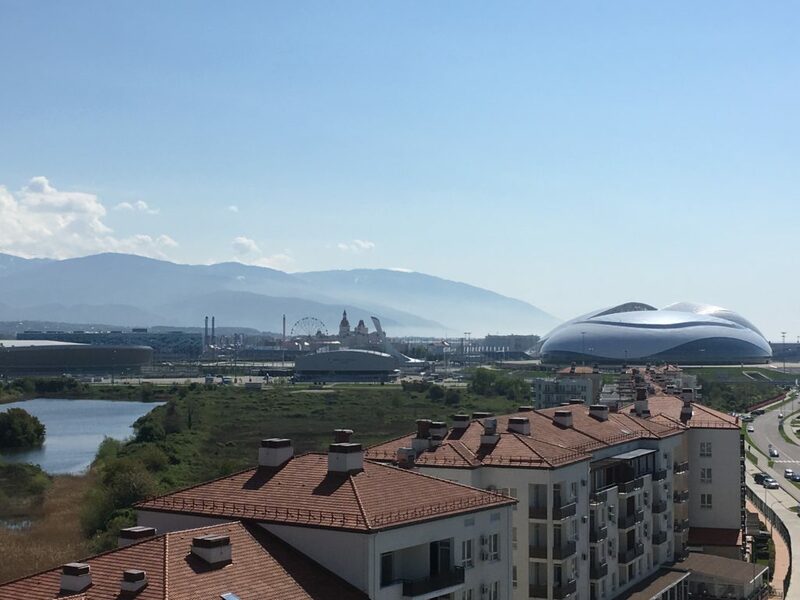 See, the airport and the Olympics venues are in a suburb called Adler, which actually sits right on the Abkhazia border. 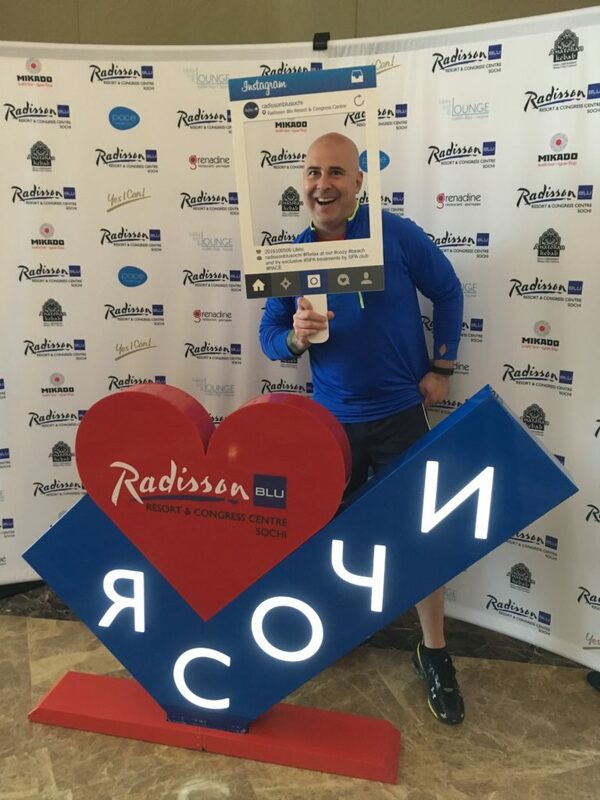 We called an Uber, which was really quick and reliable in Sochi, and made the 30 minute drive to the Morye Mall located in Sochi. 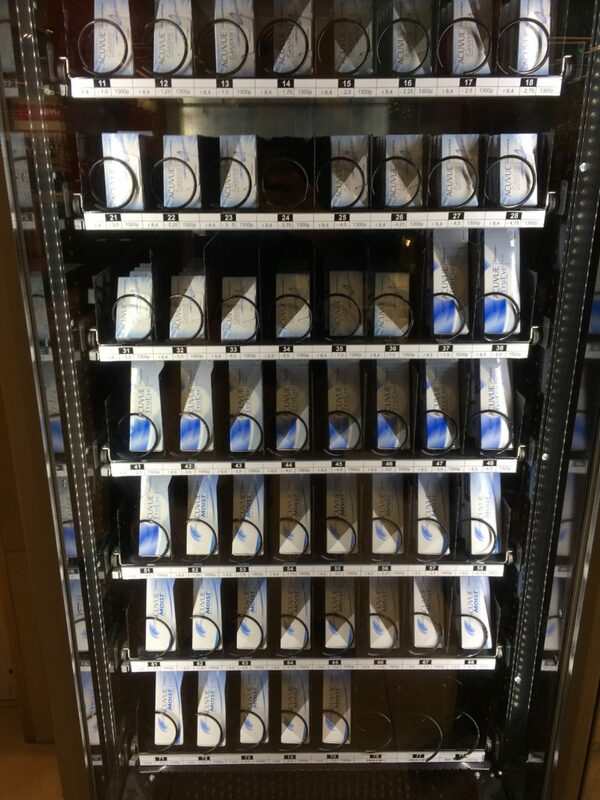 What was the first thing you see at the main entrance to the mall? 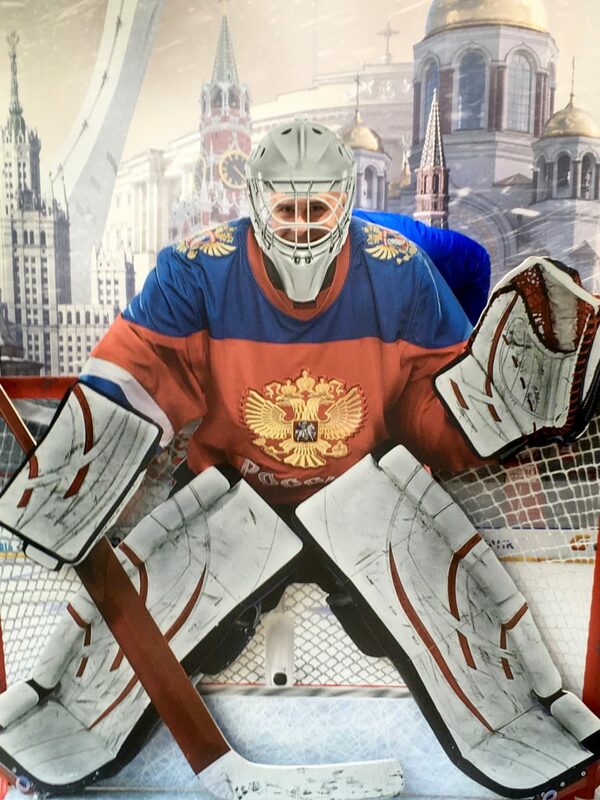 Yup, it’s like they knew I was coming…AND Sochi managed to get my name right. Bonus points for them! We wandered around the mall a bit, walking off the jetlag, and the mall was majorly modern with lots of international stores – likely a beneficiary of the Olympics as well. We were getting a bit hungry, so stopped into a pelmeni restaurant for some dinner. 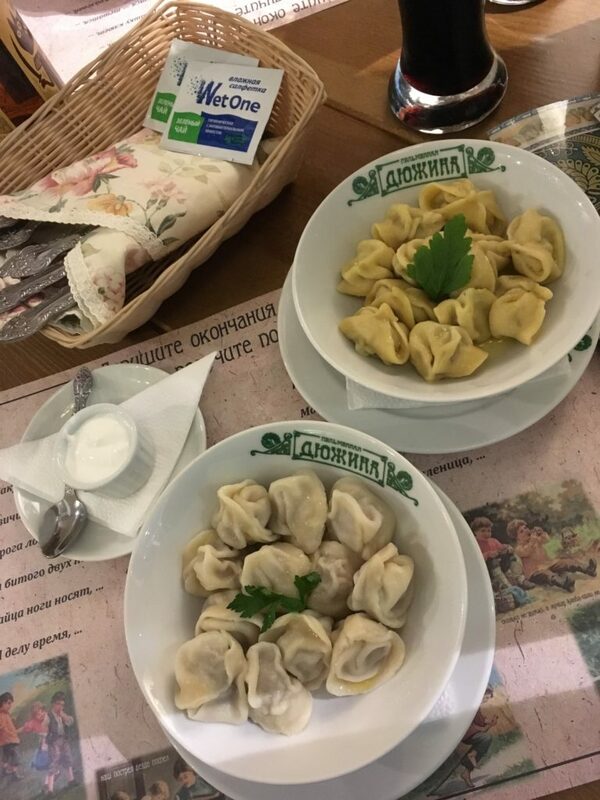 Dozens of varieties of pelmeni on the menu, and I don’t remember what we ordered in the end but they were seriously delicious. There was also a huge grocery store in the mall, so explored that a bit as well. I find grocery stores fascinating places when abroad, and a good insight to how at least some segment of the local population lives. Nothing terribly unusual about this one, except for multiple aisles with nothing but alcohol. Called an Uber which had no trouble locating us at the mall, and after a short ride we were back at the hotel where we promptly passed out for the night. 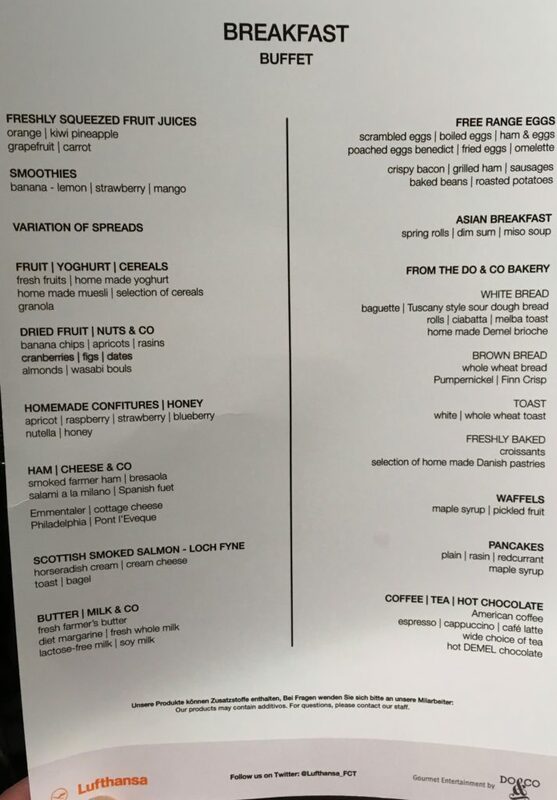 Despite all the confusion over the room rate at the hotel, they did decide that breakfast was included, and it was a reasonable spread for Easter Sunday. The breakfast was seriously empty, but there was still a huge amount of choice at the buffet, both hot and cold options, plus some local sparkling wine. Not bad at all! …and seriously, how can you resist taking a pic when the hotel has something like this set up? We hadn’t put a whole lot of thought into getting to Abkhazia, but knew that there were essentially two options: take a taxi to the border, cross over, and then wait for a minibus to Sukhumi, or find a driver/taxi who was willing to make the full trip. Given it was Easter, and we didn’t know how much traffic there would be, we opted to skip the public transport option and arrange for a driver. My first thought was to hire our driver from the airport since he had Abkhaz plates, but he he no interest in making the trip. Our second try was to see if they hotel could find us a driver. Yes, they could, but their driver wanted to leave at 6am to avoid traffic at the border, and wanted 9,000 rubles ($180) for the one-way trip. We definitely weren’t going to pay that much to get up early. So, google to the rescue and I found kiwitaxi.com which seemed to be too good to be true. A global transfer booking company that could arrange transfers anywhere in the world? They only wanted about 5,500 rubles for the trip ($100) and only 20% in advance with the rest to the driver (I imagine the 20% is their commission) so I figured I would give it a go. Only took about 30 minutes, and I had confirmation that our driver was booked, and would pick us up at 11am as we requested. Our driver Dima showed up right on time, and had a perfectly comfortable and modern SUV for the trip. He didn’t speak a word of English, but was extremely friendly and easy to communicate with. We set off right at 11am, and were at the border in just over 15 minutes. He made sure to tell us that if anyone at the border asks, we are “friends” since trying to explain a taxi might open him up to bribes. When we got close to the Russian side of the border he let us get out, and go walk through passport control. Exiting Russia was pretty straightforward, with just a couple simple questions “how long will you be in Abkhazia? When will you come back to Russia? Where do you live? Why do you speak Russian?” and we were through. Dima was just getting the car cleared when we exited, and we were ready to head to the Abkhaz border post about 100 meters down the road. Here we just pulled up to the officers, said hi, showed them passports, and they waved us through without a single question. Way too easy! The whole border had taken about 30-40 minutes due to the passport control line on the Russian side, but overall really easy. From here, it was about a two hour easy drive to Sukhumi, where we had little trouble finding our hotel. I asked Dima if he would be interested in picking us up in two days, but when we told him we needed to leave at 9am he wasn’t interested since it would mean leaving Sochi super early. No problem, we had two days to sort out transport or use kiwitaxi again, so figured we were set. Now, time to explore Abkhazia! The day of the trip was finally here, and despite lots of last minute changes needed to deal with some unexpected work and personal commitments, I finally was able to salvage part of the trip. Unfortunately, that would mean missing two of the stops we had planned, but at least we would get to Abkhazia which was one of the parts I was super excited for. American had changed their schedule about three months before my flight, and suddenly my DCA-JFK flight no longer existed. They decided instead to book me on an ERJ-145 flight instead, which meant an involuntary downgrade. Because it was the short part of an international itinerary no compensation was due, and they seemed completely uninterested in helping. 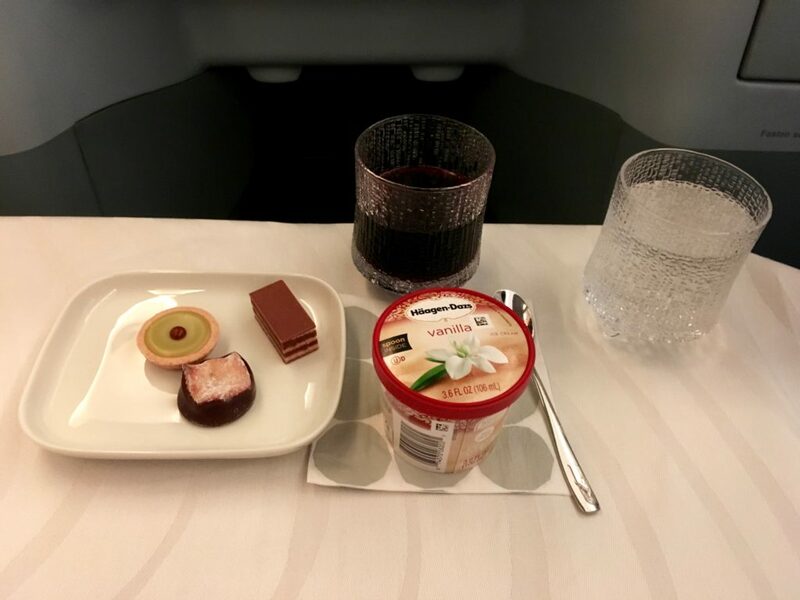 Fortunately, about 45 days before the flight they changed schedules again, and there was now an option with first class. It meant a relatively short two hour connection in JFK, but I figured it should be doable in the spring. Calling in, I got the rare fantastic agent who was able to force availability and get me on the new flight, and all was set. Day of travel I actually had quite a bit of time given the later departure, so decided to risk taking the metro to the airport, which was drama free. Rare occurrence on metro! 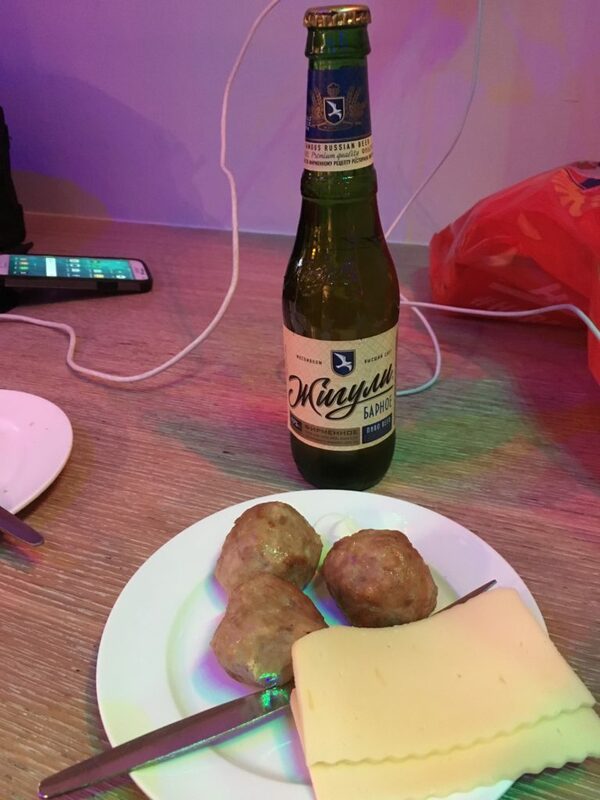 Had to check-in with an agent to show them my Russian visa, and after they made sure to show me how annoyed they were with having to help me they checked me in and I was on my way to the lounge. 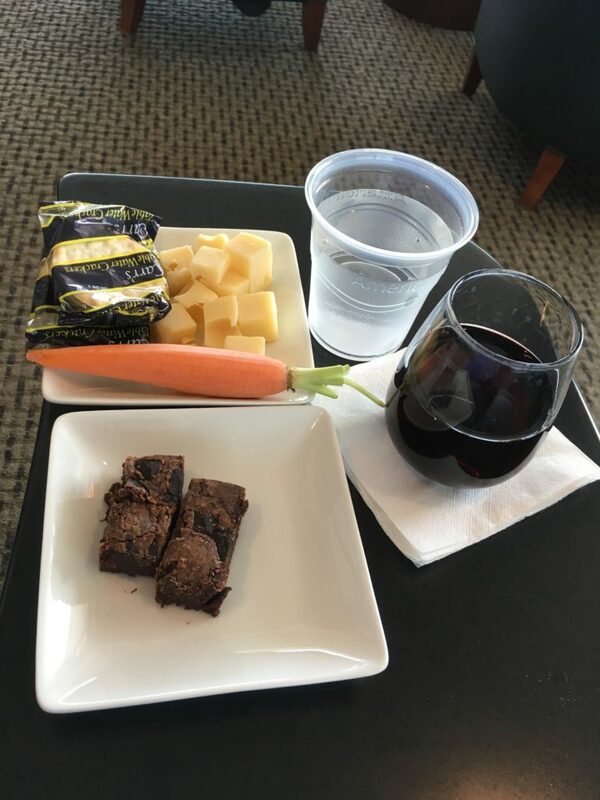 Lounge was serving the usual cheese and crAAckers along with some other unexciting kibble, but who can resist a whole carrot right before Easter? Boarding commenced right on time with some rather grouchy gate agents and a total of three emotional support animals for the rather short ride up to JFK. Shortly after boarding and being seated there was some commotion in the entryway. I didn’t catch the whole conversation but apparently the passenger had accidentally packed some vital medications in the bag she was forced to gate-check, and needed/wanted to get them out. All I heard was the rather nasty gate agent saying “I don’t care what you think you need you ain’t gettin’ the bag now!” Followed by “you know what, you’re a very nasty woman!” from the passenger. 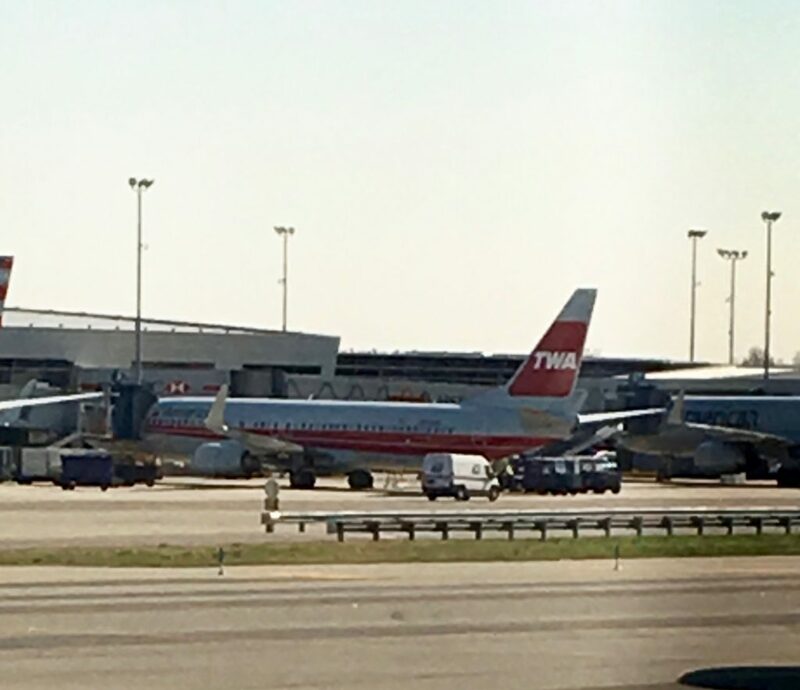 I was having visions of Dr. Dao at this point, and had the iPhone really to shoot prize-winning footage….but eventually the pilot who was great managed to calm the situation (after the gate agent yelled at him to) and everything was defused. After that bit of excitement, departure time came and went…except we weren’t going anywhere. 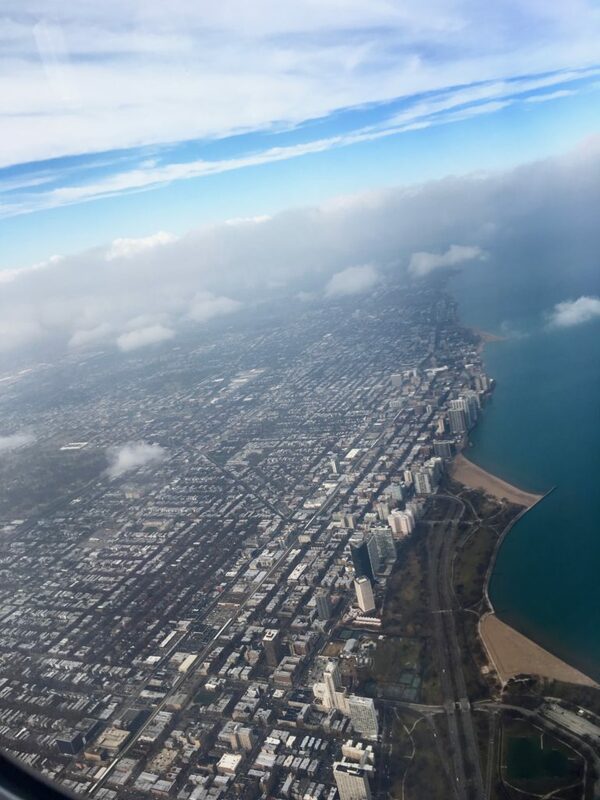 The pilot came on at five minutes past the departure time and told us we would be another 15 minutes because they were trying to locate…a first officer. Apparently the first officer’s dog had died and they were desperately trying to locate a replacement one. Another five minutes passed, and we were assured one bad been found, and he was “on his way” and we “should be out of here” in 15 minutes. Of course, 15 minutes came and went…and no first officer. 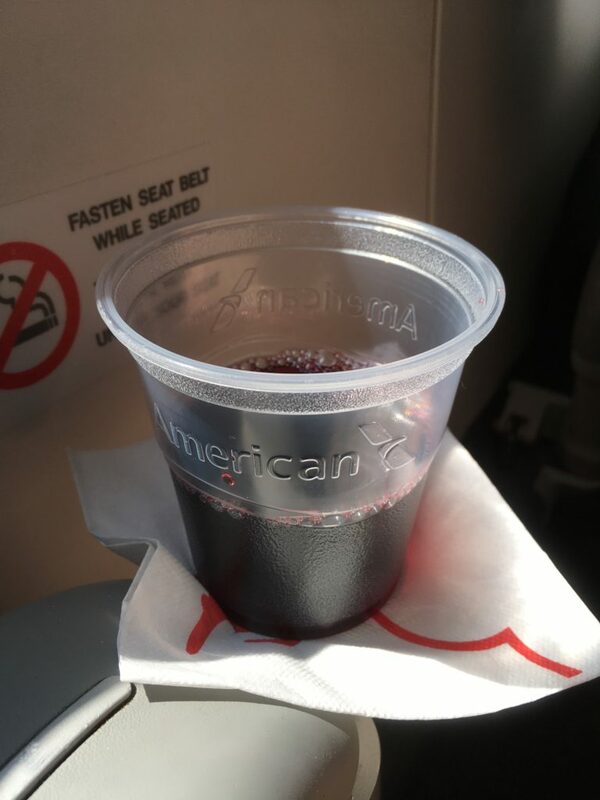 Once in flight, the crew broke out AA’s finest stemware, and passed around the kibble basket. 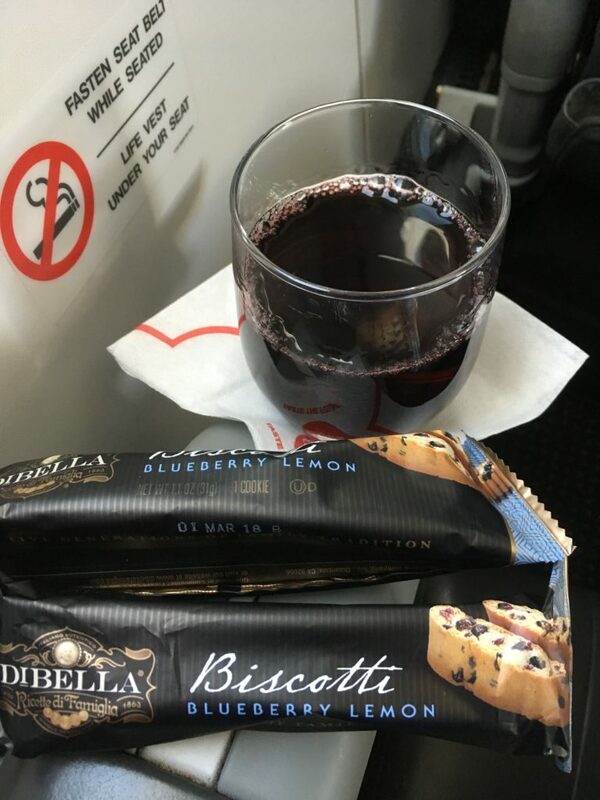 Since I’m addicted to the DiBella biscotti, I wasn’t complaining for a 42 minute flight. Never seen blueberry lemon before…yum! So despite flying well over 2 million miles and over 250 transatlantics in each direction, I’ve never flown internationally out of JFK before. I remember the day when international travel almost ensured you would head to O’Hare or JFK, but these days unless you’re flying a smaller international carrier, JFK is super easy to avoid. 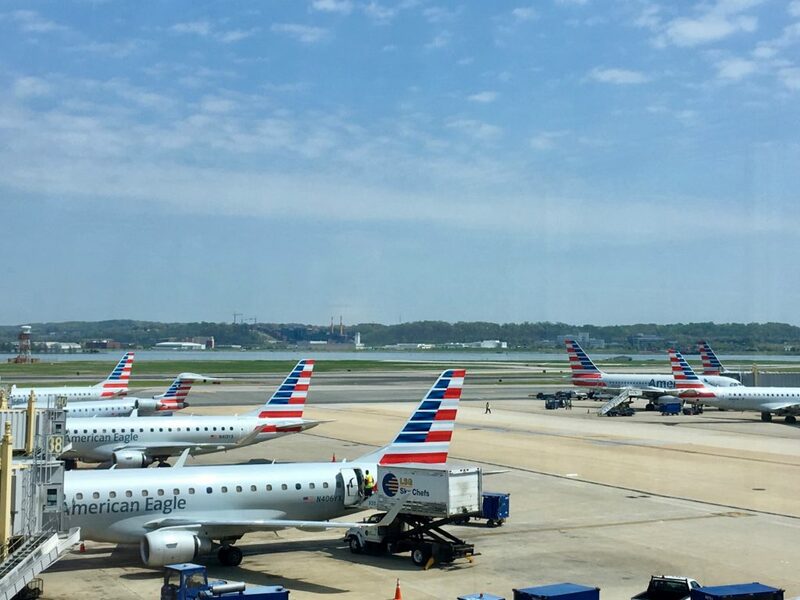 Of course, it was just my luck that my arriving flight would arrive as far from the International First Lounge as possible, and the departing flight which normally leaves from right by the lounge was also leaving as far away from the lounge as possible. Ian was perfectly fine skipping the lounge, but I was having none of it, so he met me near my arriving flight and off to the first lounge we went. 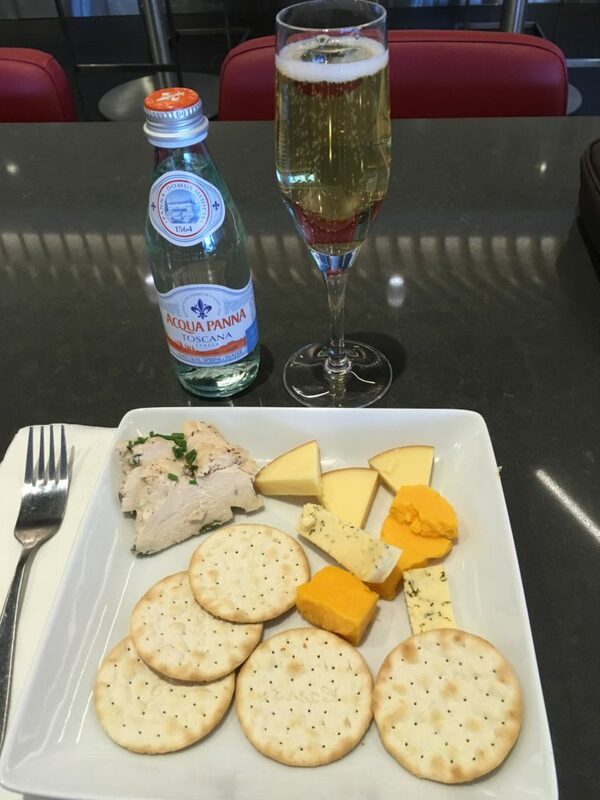 I mean, I’m not going to turn down Bollinger and a nice cheese plate! Unfortunately, given time constraints, I had to limit myself to around two glasses, and then make the long trek over to my departure gate. I wished Ian well, made sure all his shots were updated for his flight back with the proletariat, and then boarded. Pre-departure champagne, blueberry juice, and water were offered. I asked for a champagne AND a water, and with the sigh that followed you would think I was asking for them to move Heaven and Earth. But, I was successful. 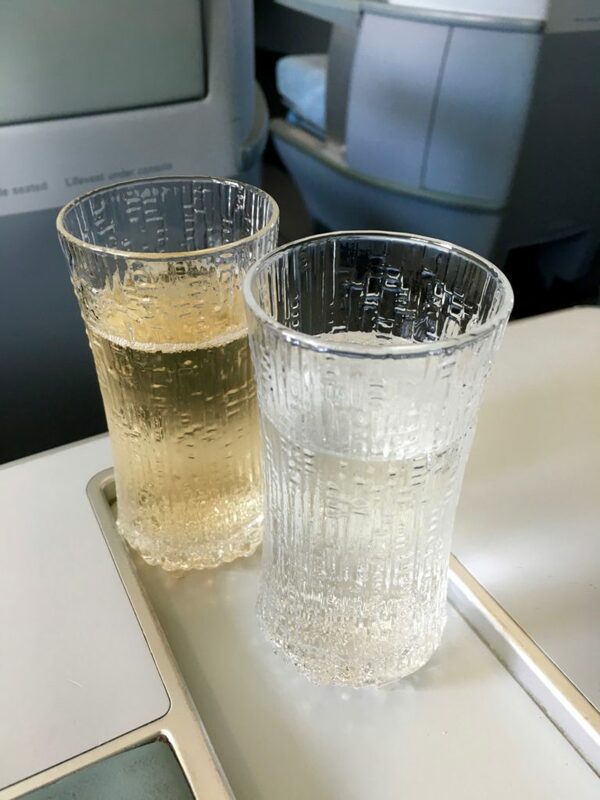 I still love the Littala crystal – even for pre-departure drinks. I really need to pick up some of this glassware for at home. Unfortunately, right before the door closed, a couple boarded sitting right in front of me with twins who looked no more than a month or two old…and were already crying their lungs out. You have GOT to be kidding me. 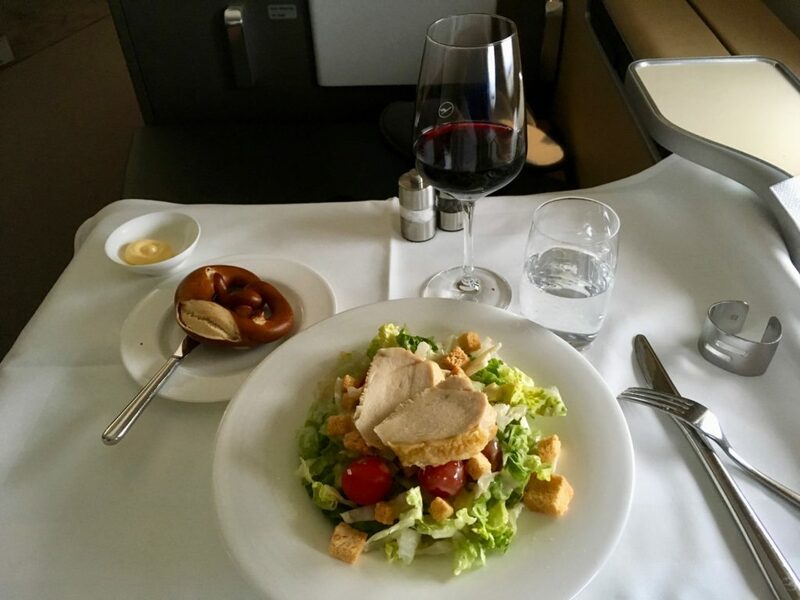 Seeing the glares they were getting from the other passengers, the purser suggested that all 12 seats in the mini cabin of business class were open, and perhaps they would be more comfortable there. They agreed to move, much to the relief of the other passengers. With that sorted, time to get comfy and rock the Marimekko slippers! About 30 minutes after departure drinks and snacks were finally offered. 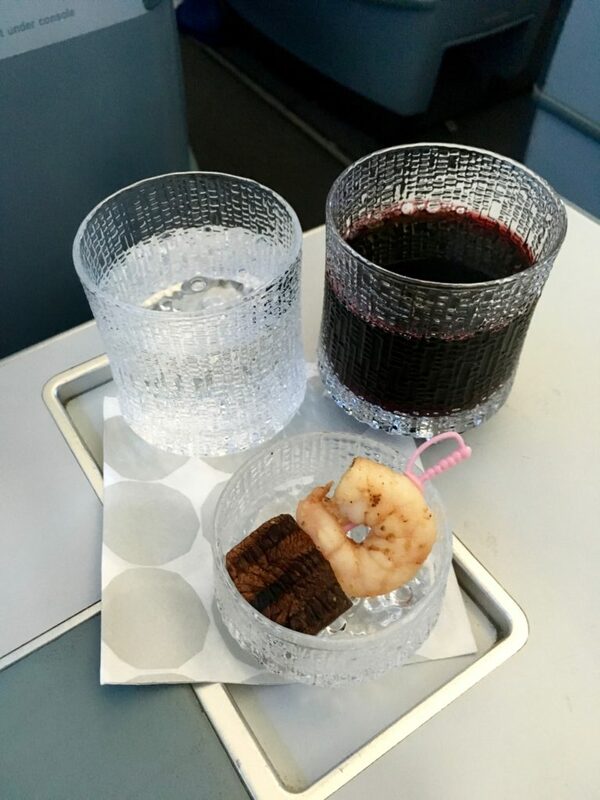 While I was glad not to see the usual mixed nuts, a single skewered prawn doesn’t really make much of a cocktail snack…. Even more surprising was that the meal was all served on a single tray. No courses here. 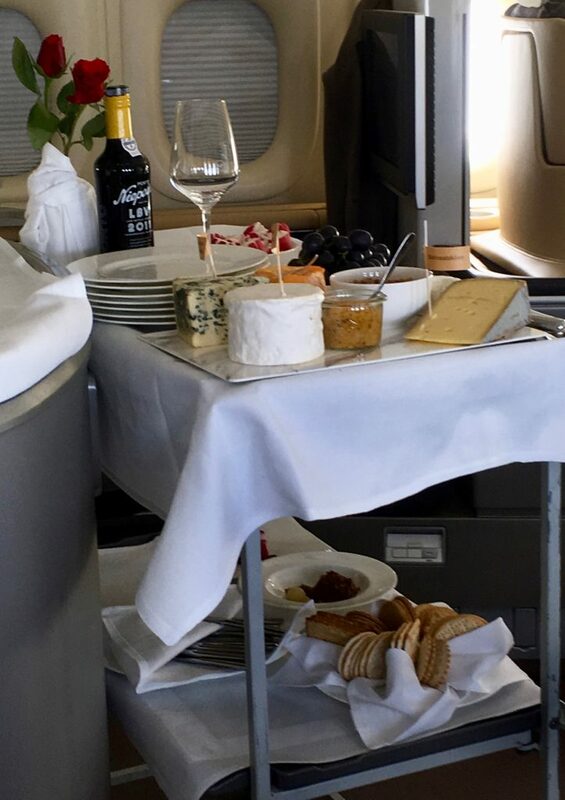 I would be less surprised if this was a late departure, or if I requested the executive meal, but nope…everyone got their entire meal on one tray. 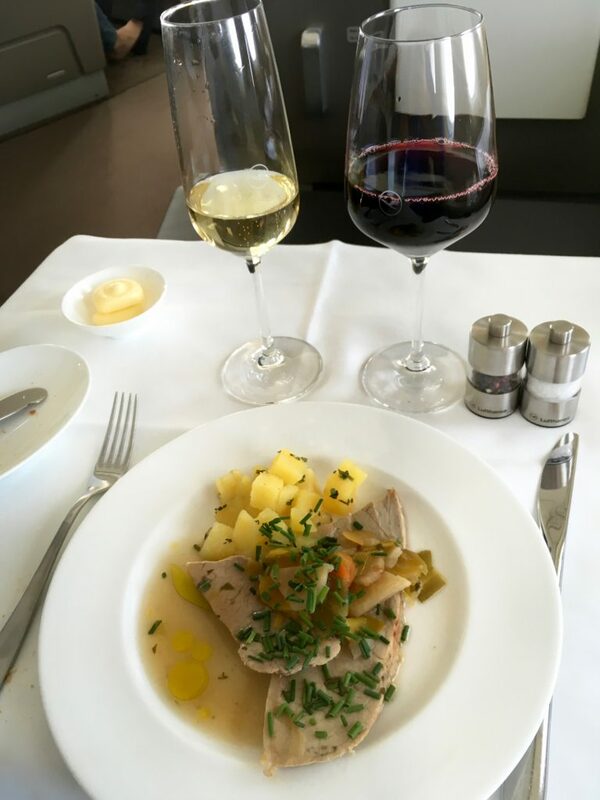 This looks like something that would be served on a domestic flight in the US and not internationally! That said, the beef was rather tasty along with the potatoes, but the salad and cheese course were rather stingy and disappointing. 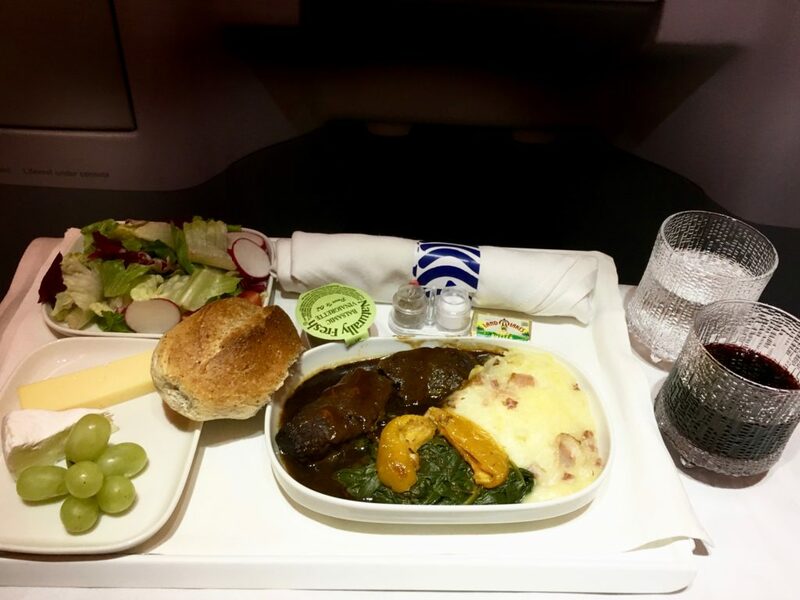 Definitely one of the most disappointing business class meals I’ve ever had across the Atlantic. 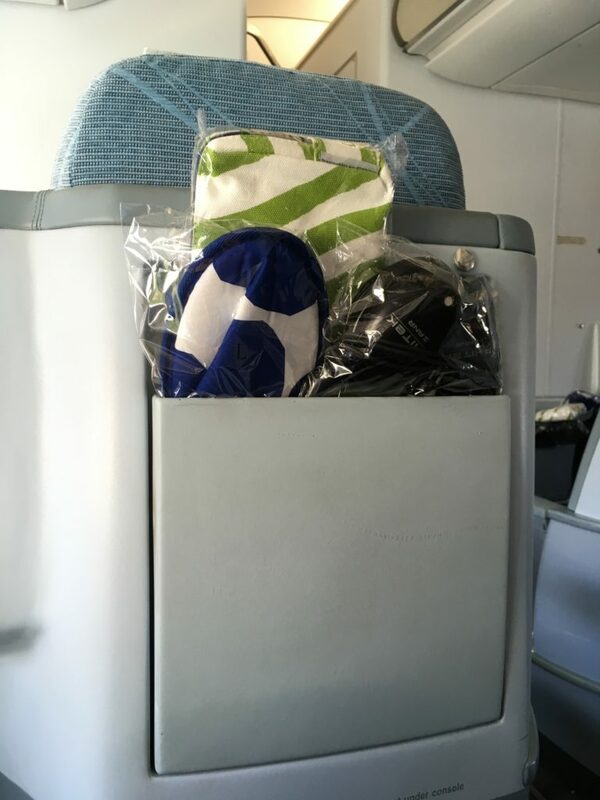 Boo to Finnair on this one! An hour into flight, my free internet cut out. Supposedly Finnair elites and OneWorld Emeralds get free complimentary internet for the entire flight, but for whatever reason Finnair had forgotten to load this data into the computer for this flight, so everyone was cut off at one hour. 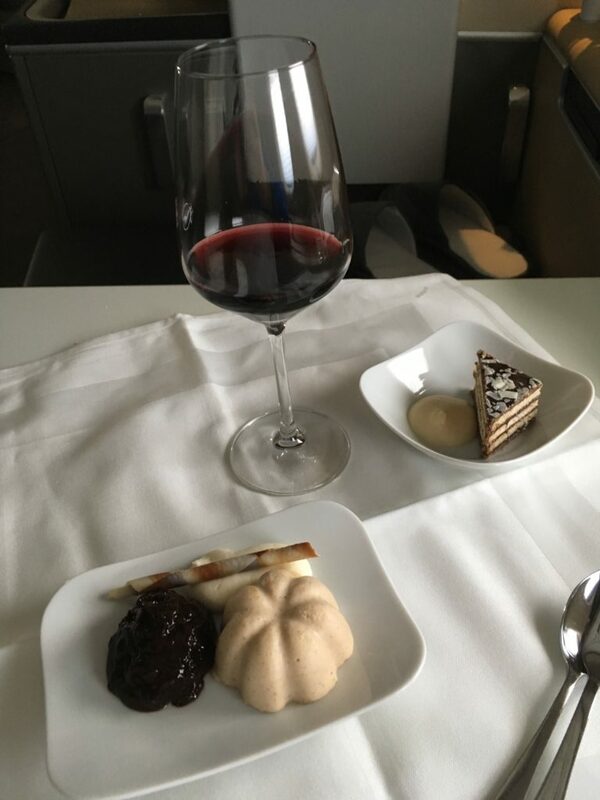 Ended up paying for the rest of the flight, which per the purser’s recommendation I will now dispute with AmEx…. I still wasn’t tired, so after a bit of time watching tv, I used the call button to ring for another glass of wine. 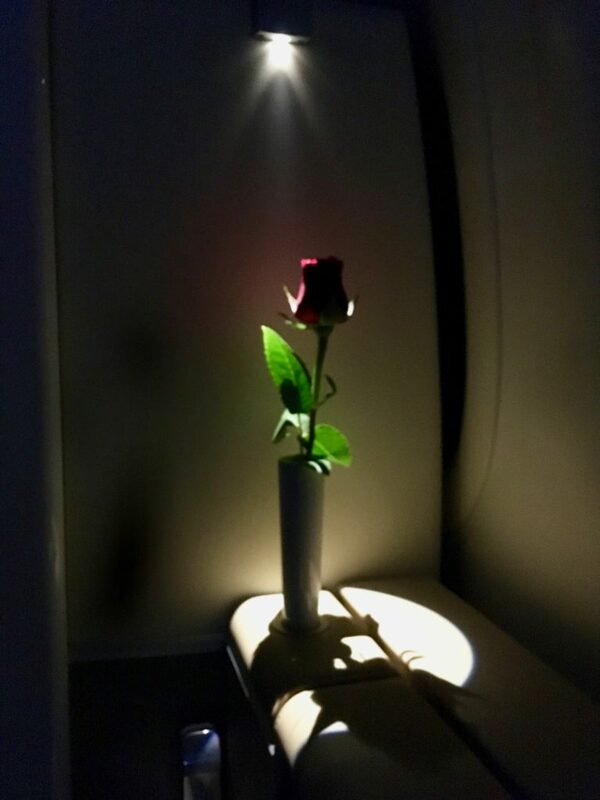 A new/different flight attendant appeared this time, and he was more than happy to bring me one. He also brought a mini snack of mixed nuts and dried fruits. Thought it was odd he served this right after dinner had finished, but it was definitely a nice appreciated touch. After finishing this glass of wine I was getting pretty tired, but there was just one problem. Two extremely loud large russian women in the row behind me having a conversation and cackling at a volume that I’m sure even the people back in coach could hear. I’d already asked them several time to keep their voices down because people want to sleep and was just met with a dirty glare in return. 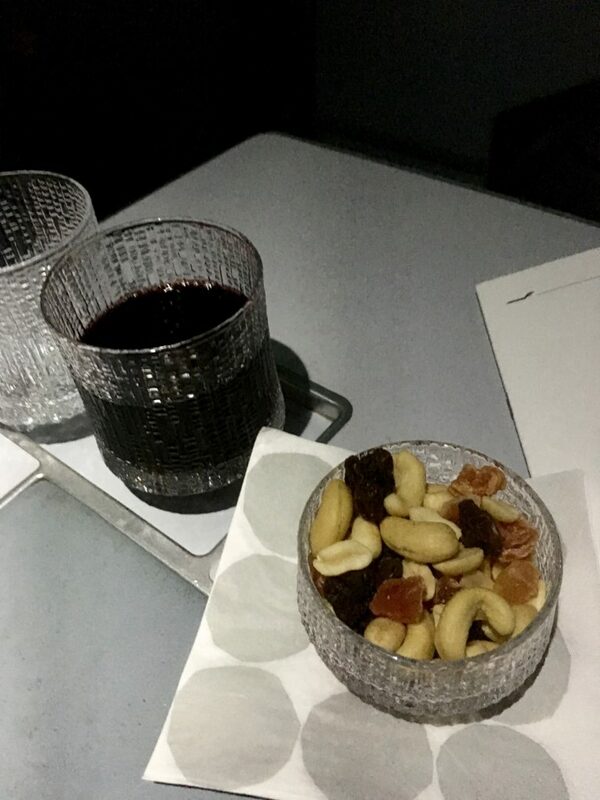 The flight attendant who’d brought me the nuts tried to quiet them as well, to no avail. He suggested I could move to the back of the cabin where there were plenty of seats and it might be a bit quieter. Fortunately, when I returned from chatting with him they had mysteriously and suddenly passed out cold. Saved! At this point I managed to pass out for a nice uninterrupted five hours of solid sleep, waking up just as we crossed the Finnish coast on descent. Flight delivered in the ways that were most important to me, a comfortable seat for sleeping and a cabin temperature that made it possible. The food was a huge let-down, but again, it was adequate. However, if Finnair really wants to compete for connecting traffic they really need to up their game in this department. We arrived in Helsinki about five minutes late, and only had a 35 minute connection to Moscow to begin with. Fortunately, there is no need to re-clear security in Helsinki, and since we also did not need to clear immigration it was a very easy transit. No time to check out the lounge, but our gates were right next to each other and I think the change of planes took maybe five minutes maximum. Most passengers were already boarded once we got there, so just a few minutes after boarding the door was closed 15 minutes early. There was only one row of eurobusiness 2×2 seating on this ERJ-190, and only one other passenger, so we each had two seats to our self. It should be noted that unlike Lufthansa, Finnair sells all the seats in eurobusiness on the ERJs, so you don’t get a free seat next to you. 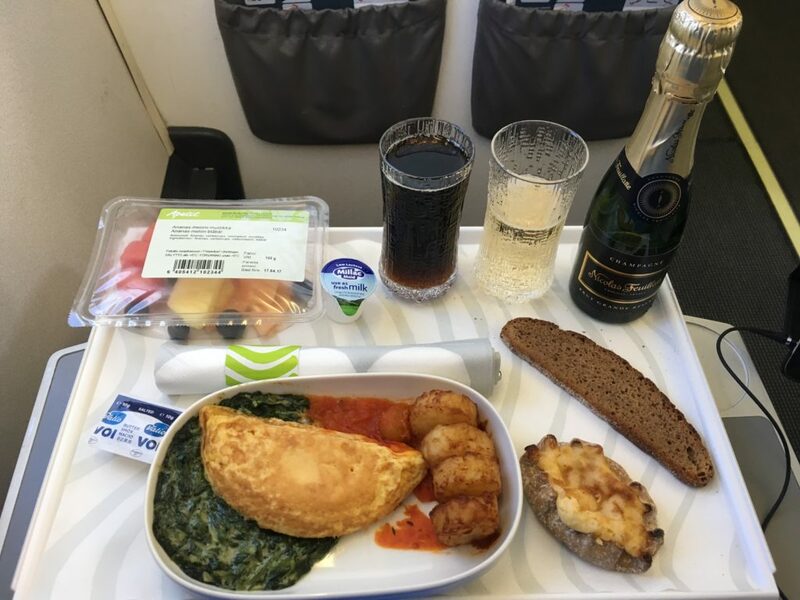 The only thing you get is a free meal, when those in economy had to pay for buy on board. 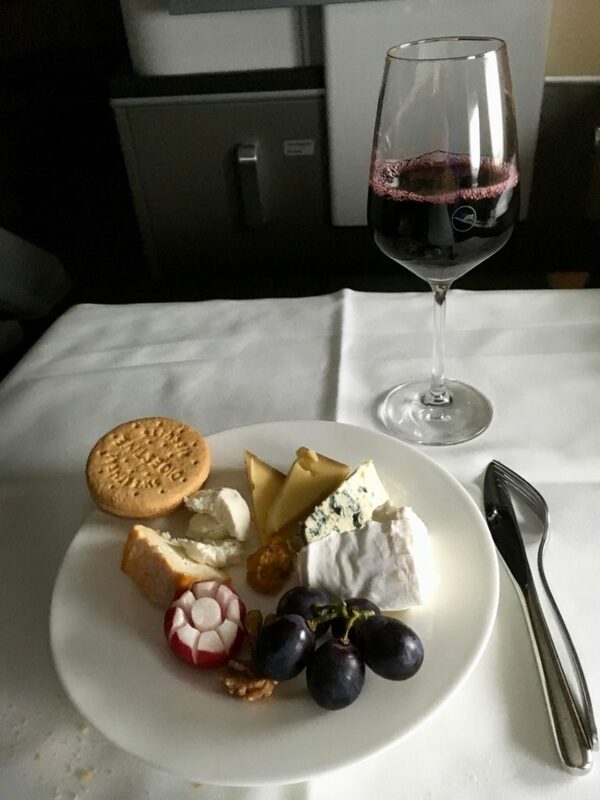 Not a bad meal for a 90 minute flight, and two main thoughts: yes, the fruit may have been packaged, but was fresher than anything United serves. Maybe being sealed held in some moisture? 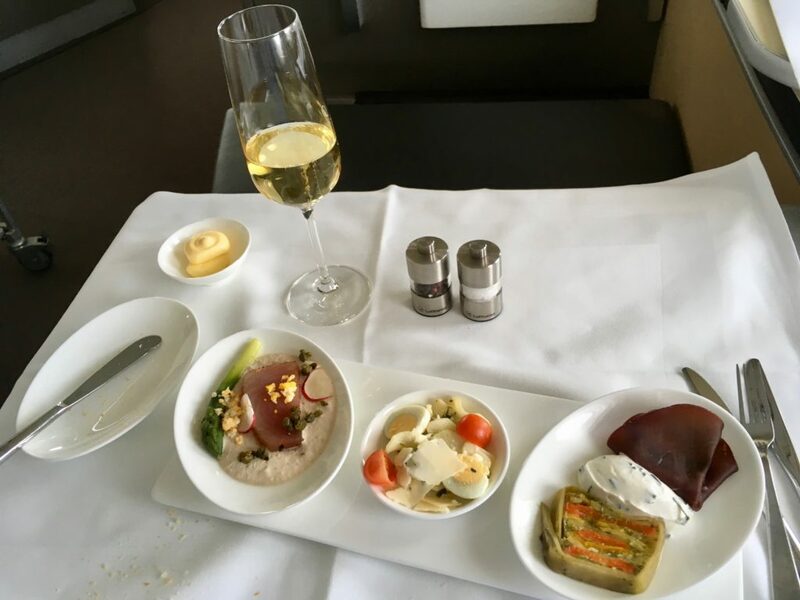 Also, the flight attendant noted: “surely you would like some champagne, you can’t fly business class without it!” Best flight attendant ever! Immigration was a relative non-affair, with no line at all when we arrived. Got a few questions from the agent, who seemed mildly amused that I spoke Russian. Why do you speak Russian? Where did you learn it? How do you still speak it if it has been more than 20 years? She was seriously curious, and every time I answered the other agent in the booth would giggle. I guess my accent is amusing or something. Right past immigration there was a check-in flight for connecting flights, and the agent was able to issue our Moscow to Sochi boarding passes, even though it was a separate itinerary. Next stop after checking in was to find Starbucks. 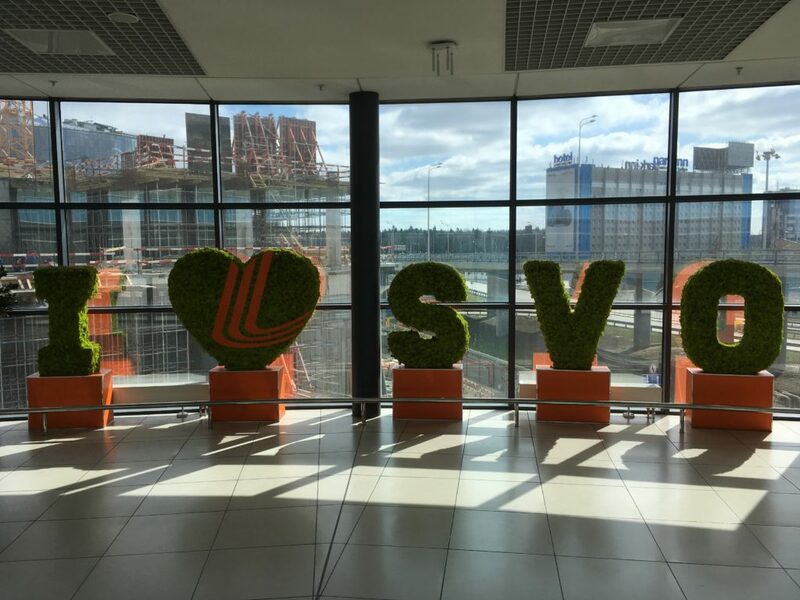 I knew there was one at the airport, but we weren’t sure exactly where. We decided to trust the Starbucks app, and head to the next terminal over (connected landside) and search for it. Ian knew better than to resist my need for caffeine, and we were off on the hunt. 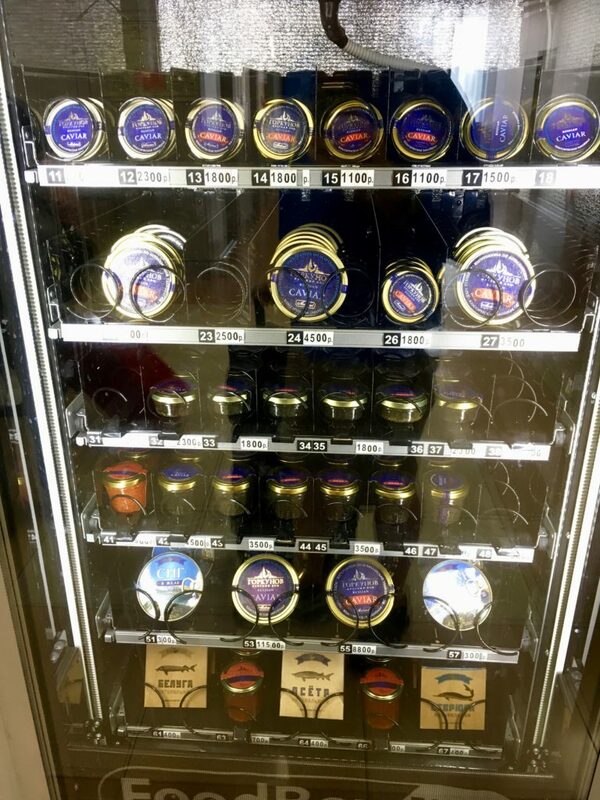 All price points from $20 a tin up to well over $100 a tin. 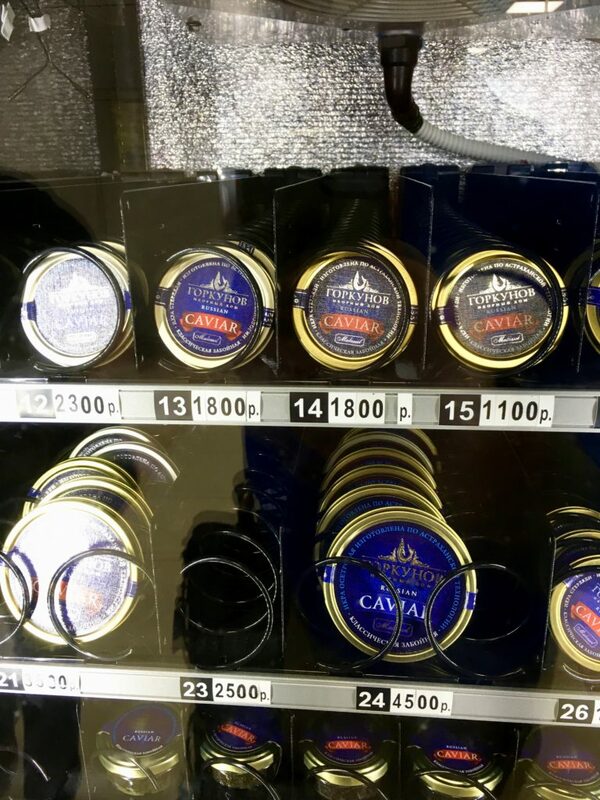 I mean, everyone buys $100 worth of caviar from vending machines…right? Security wasn’t too bad, except for the guy who was getting busted for trying to take a cage filled with rabbits through the x-ray machine. I mean, totally normal, right? Next stop was the lounge, which since we had arrived on OneWorld they wouldn’t let me use with my SkyTeam Elite card. 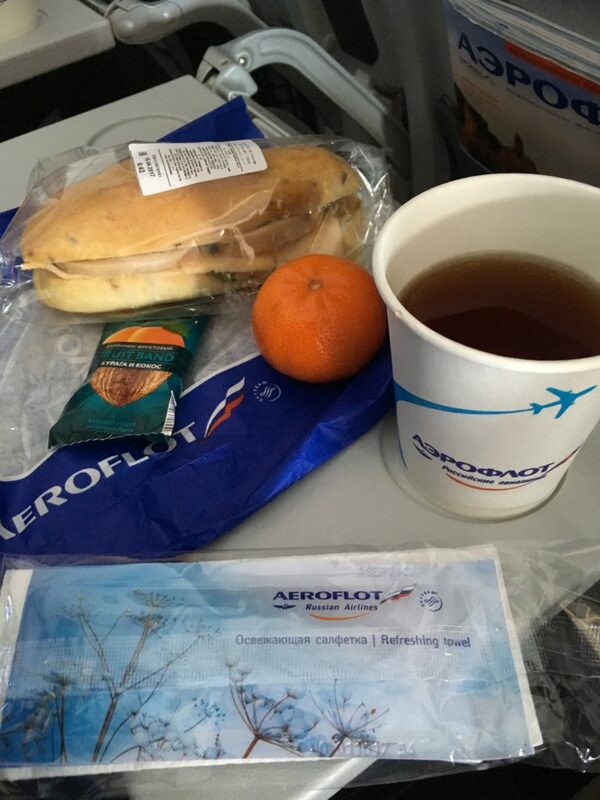 Apparently, no lounge access allowed to SkyTeam Elites on domestic flights with Aeroflot? Fortunately, they did accept Priority Pass, so that made short work of the 90 minutes we had left until boarding. Reasonable selection of food and beverage, and more importantly, places to charge devices. Biggest downside is the lounge was completely dark inside, and emerging from the lounge was like walking back out into bright daylight! Boarding was nice and easy, and they actually made time for elites and business class to board first. About a 90% full A321 down to Sochi today, but fortunately we had booked the A and C seats and hoped nobody would take B. We asked the gate agent nicely, and she verified it was still open and she wouldn’t put anybody in it. Score! 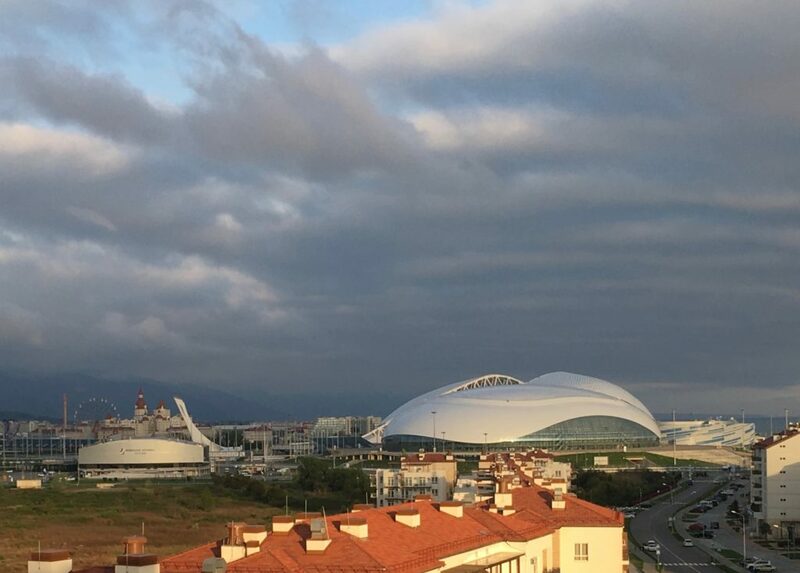 Landed right on time in Sochi, and it was time to begin the adventure! I don’t usually get too excited for flights, especially when they mean getting up early, but the combination of my room being slightly warm along with my upcoming flight on my favourite product had me up even before I needed to be. Walked over to the B terminal of the airport, and stopped at Starbucks for a bit of caffeine to get me motivated for the long day ahead. Back to the Sheraton, packed, checked out, and then did the brisk 10 minute outdoor walk to the First Class Terminal. They’re definitely not used to people arriving on foot, but were excellent about checking me in and getting me sorted out. 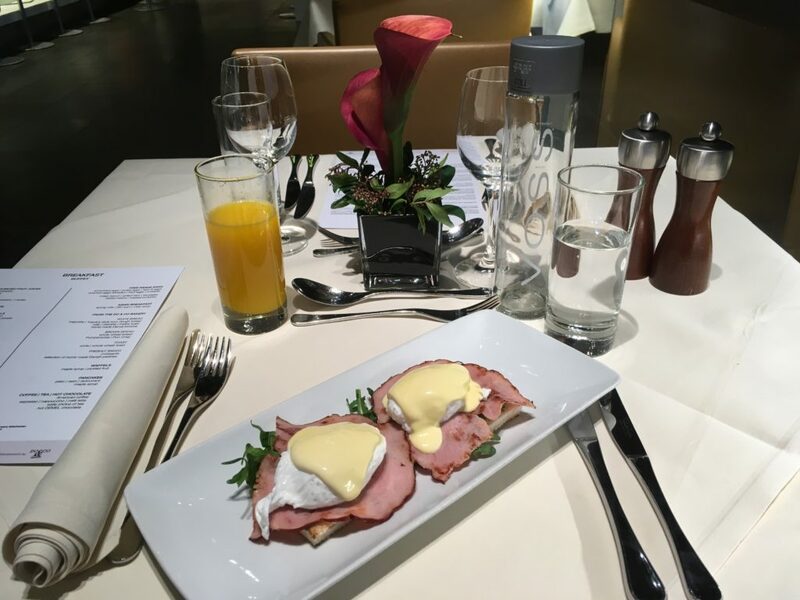 I decided to go for the eggs benedict and a fresh orange juice. The eggs were actually really good, with just right amount of hollandaise sauce which was just the right tartness. Once again, Lufthansa delivers in my book. 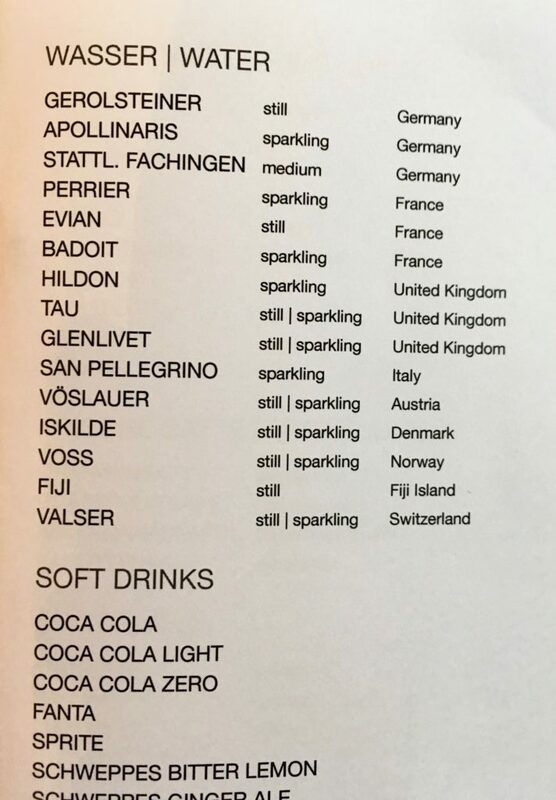 Now, I may not be Madonna who is rumoured to require Voss water to take her baths in, but I was pretty impressed that the First Class Terminal also has a water menu, which somehow I’ve never noticed on prior trips. Voss for me today! There was a long queue in the jetbridge after we took the elevator up, and the driver was having absolutely none of it. “Entschuldigung, bitte!” all the way down, pushing his way passed all the queued up passengers to get on board first. It was on the verge of mildly embarrassing, but at the same time a bit fun to be treated like a celebrity. 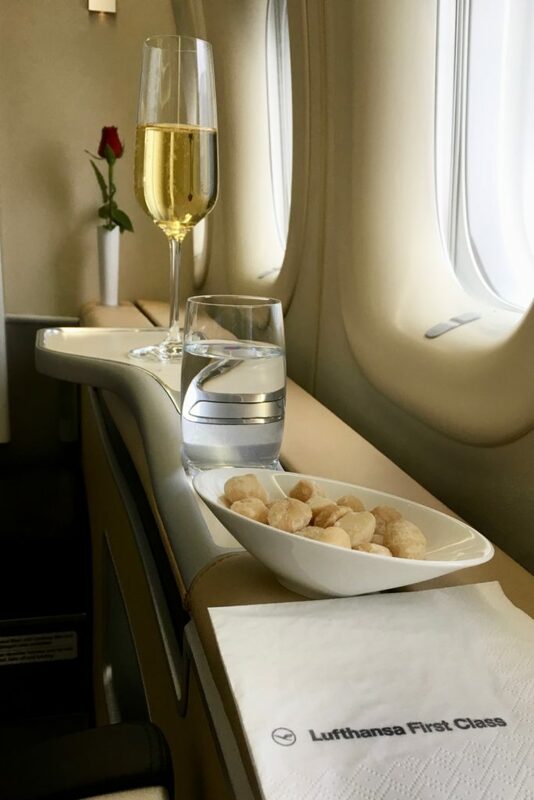 Good to see after my last couple of flights that the macadamia nuts are back, and the champagne remains cold! 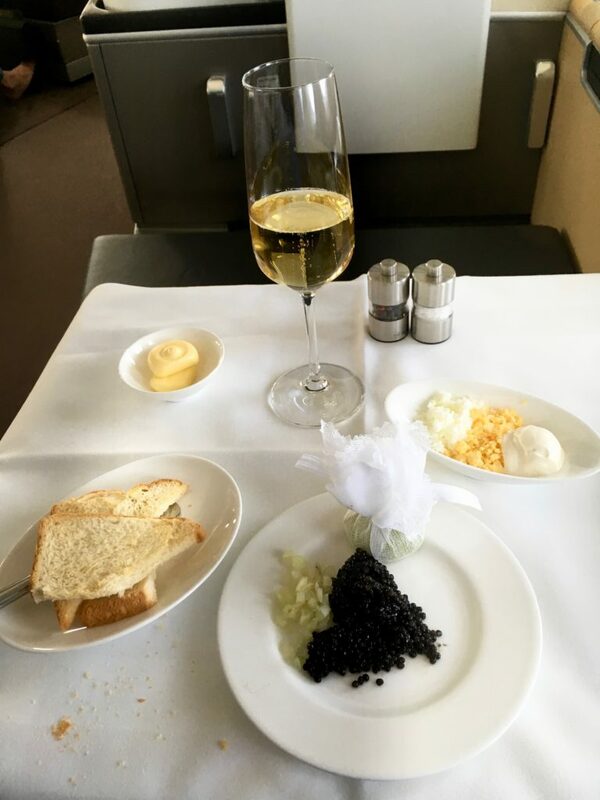 Clearly, Lufthansa has gotten the message that I enjoy my caviar. Despite being booked six of eight in first today, the portion took up half of the plate! I should start traveling with my own bread crumb scraper…I clearly make a mess! 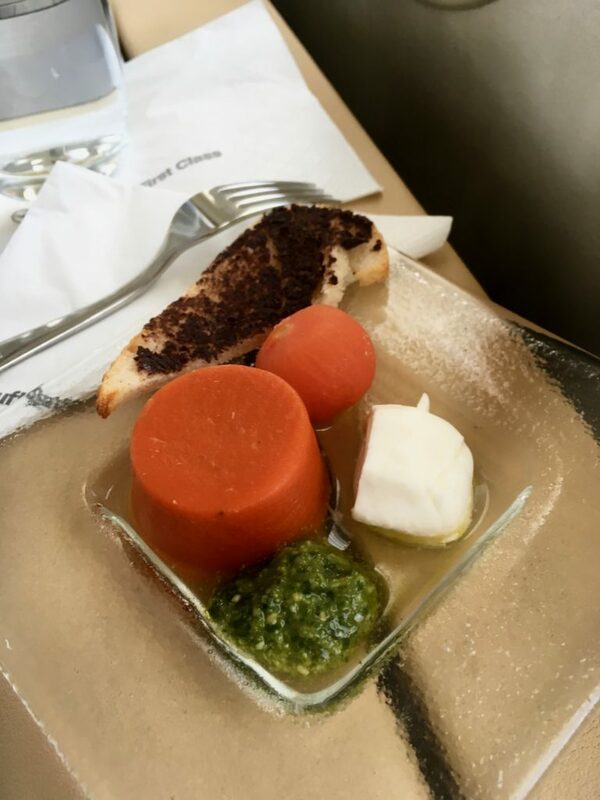 Today’s appetizers were tasty, but not mind-blowing. Tuna with Caper and Veal Sauce, accompanied by green Asparagus. Quail Egg and Black Salsify Salad presented with Bolzano Sauce (this one was super tasty), and Grilled Vegetable Terrine, Chive Curd and air-dried Beef. 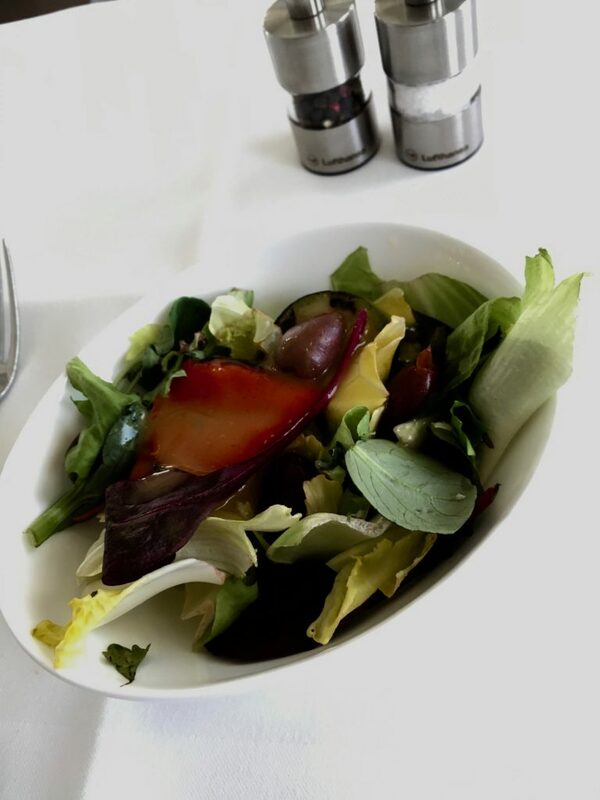 I liked how they did the salad after the apps…more courses, and extended things a bit more. The passion fruit dressing, as usual, was weird. One thing I don’t like about Lufthansa is how the feel the need to try funky dressings. Of course, maybe I should be thanking them for broadening my horizons…who knows. Went with the sous-vide prime boiled veal with red hot pepper mostarda, root vegetables, and parsley potatoes. Honestly, it wasn’t that good. The veal was flavourless, and the whole thing tasted like something out of a 1970s British cookbook. Boiled and bland. But not all was lost…cheese was on the way, and delicious as always. How can you not love a cheese cart like this when everyone else serves you dried out pre-plated crap. Rock salt cheese, St. Agur, Goat Cheese with Honey, L’Explorateur and Langres. Gorgeous cheese course. 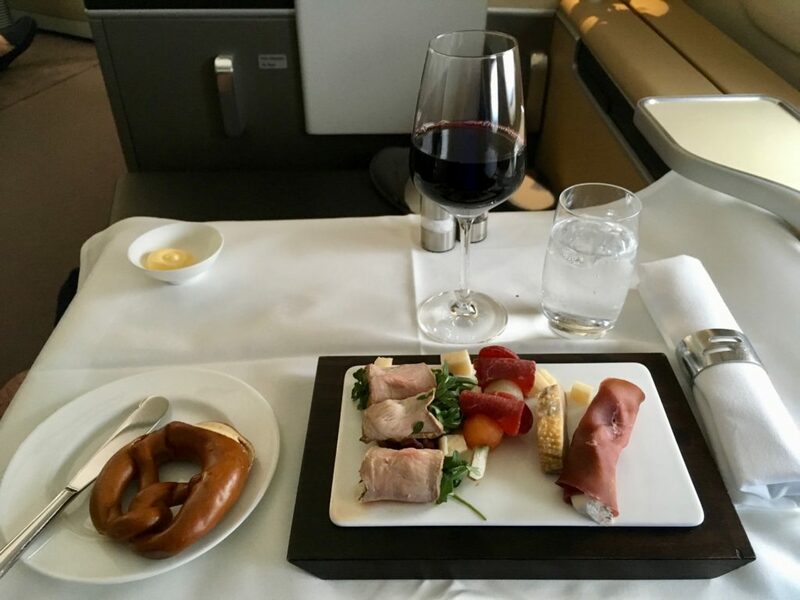 I’m not sure anyone does it quite like Lufthansa. 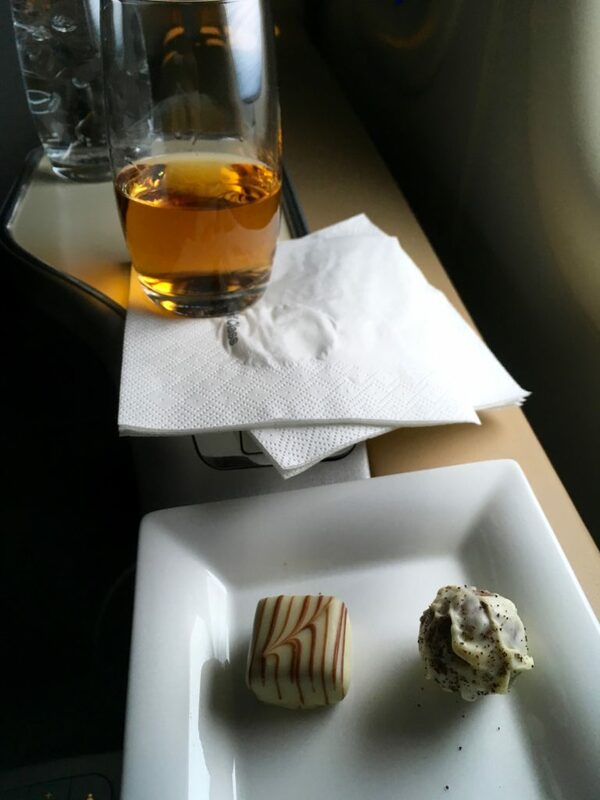 My usually Johnny Walker Blue and a couple of chocolates to finish things off. No room for a full dessert today. After four solid hours of sleep, I woke up just in time for the pre-landing snack. 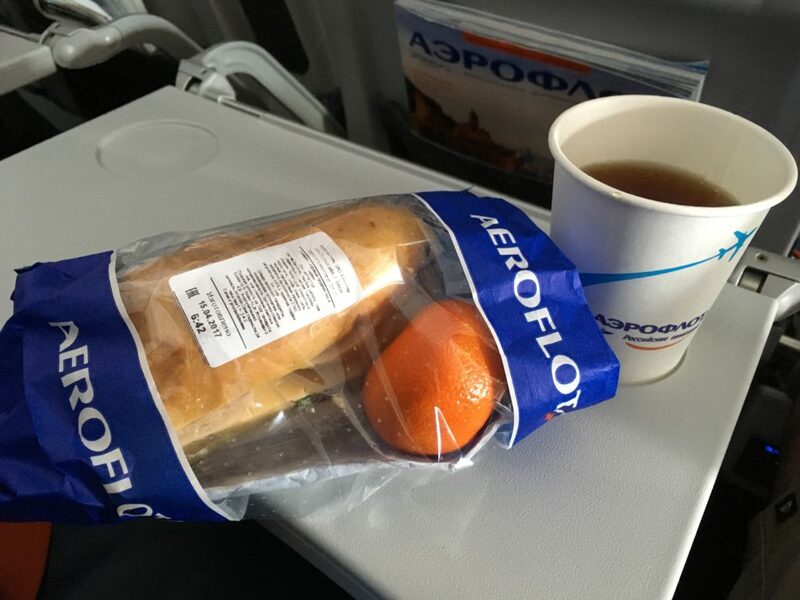 The new snack/landing menu are the same, and you just order from it as you please during the flight. I went with the Italian Spuntino plate with melon and ham skewer, bresaola with creem cheese, guinea fowl confit, arugula veal roll, and parmesan cheese and tomato olive tepanade. Definitely a winner for a second meal. Plus…pretzel bread! She insisted I also needed some greens, so I agreed to a salad with chicken as well. …and some sweets to finish it off. Not because I wanted them, because she insisted. They were, of course, delicious. 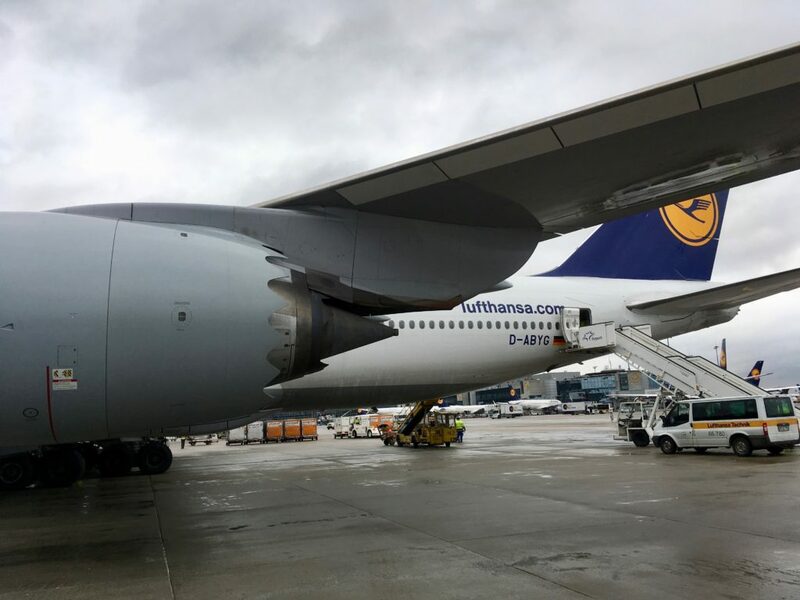 Once again, a fantastic Lufthansa experience. 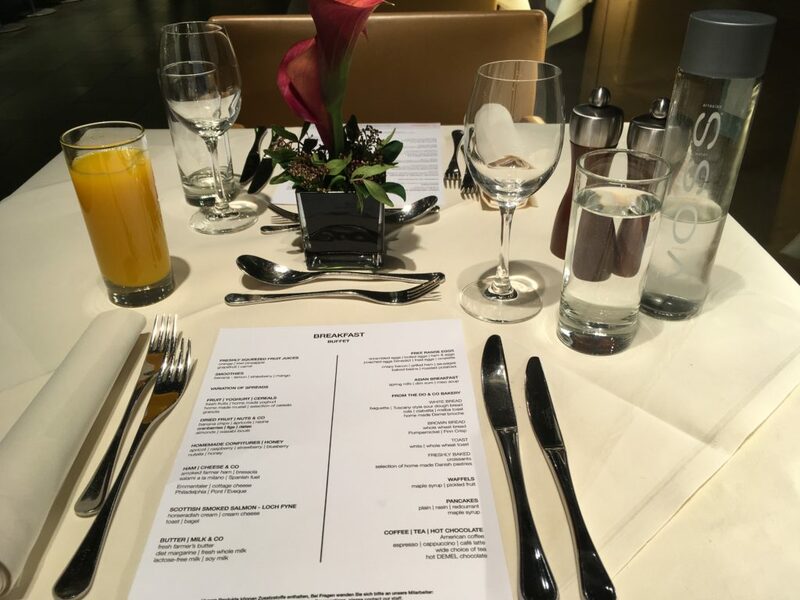 The food today wasn’t exactly my thing for a few of the courses, but the fantastic service more than made up for it. Unlike lots of other folks, I actually find the Lufthansa seat great for relaxing and sleeping, although it is slightly lacking in the privacy front. I feel like they do classy in a great way that is refined and attention to detail without being at all pretentious. I won’t claim it’s the “best” product in the skies, but is probably the one that meshes best with my personality. 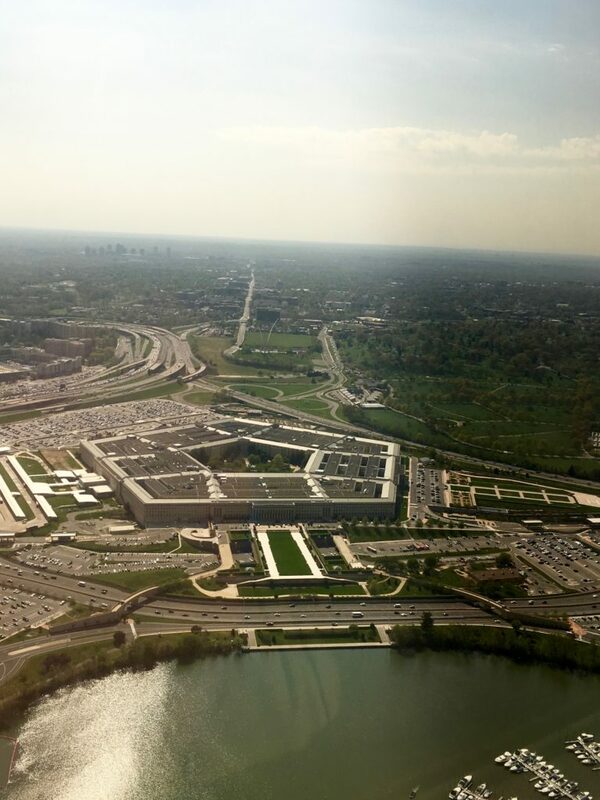 Upon landing, I was worried that once again the Global Entry machines would declare me persona non-grata since I was on a one-way ticket from Egypt. I’ve had very unpleasant experiences with this in the past, so really wasn’t looking forward to what might await me. This time, however, no problems at all and I was through immigration in maybe five minutes and on the way to my connecting flight. Monorail over to the United gates, not too bad of a line at TSA PreCheck for once, and a quick stop at Starbucks for some caffeine. 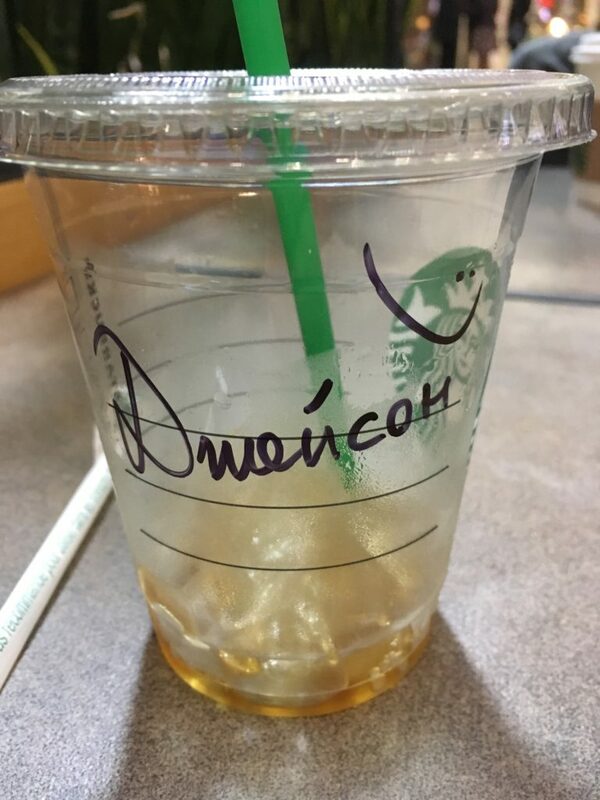 The wait at Starbucks was much longer than TSA (ugh!) but soon I had my caffeine and was ready to struggle through the last leg home. What can I say. 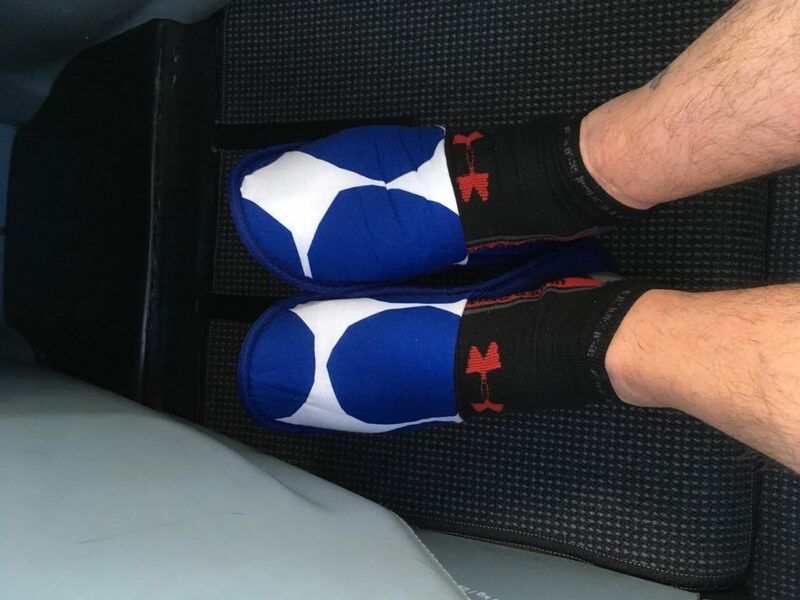 Generic non-meal United flight so not much to report on. Was too full to attack the snack basket, so had a super uneventful flight.